Here are both video and picture tutorials on how to make perfect vacuum lines on your carpet! First off, the video. I think it’s easier to explain how to make nice vacuum lines by showing you, so if you have time watch the video I recommend going this route. (plus I’m always entertaining! lol). 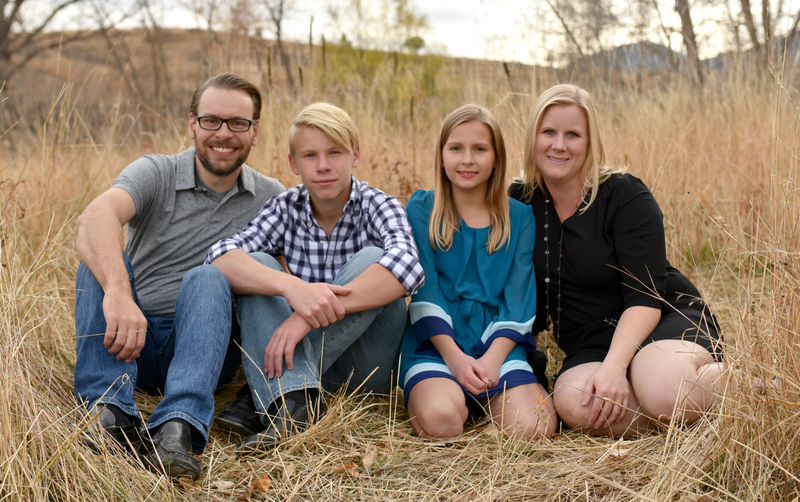 See all my blog posts with videos here. How did I create these pretty lines? You always want to start in the far back corner of your room. You push the vacuum forward in a straight line. Only push as far as you can lunge – don’t take steps forward or backward while you are vacuuming each row. This is Row 1. 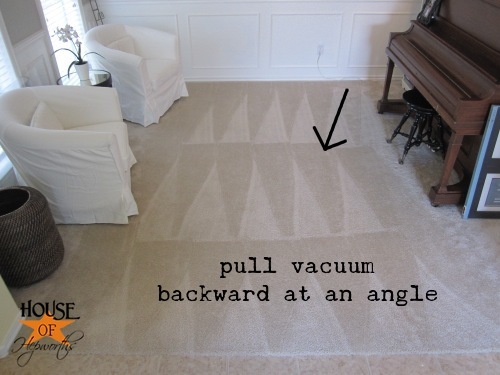 Pull the vacuum backward at an angle. You want to be lined up next to where you started. Repeat Steps 1 & 2, pushing the vacuum forward, then pulling backward at an angle. Work your way from right to left for the first row. Now it’s time to begin Row 2. 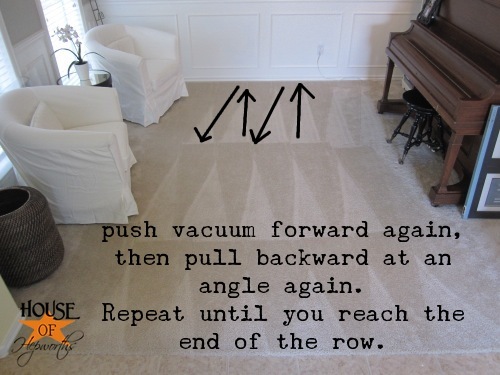 Pull the vacuum backward and begin the same process with the vacuum; push forward, pull back at an angle. However, this time you are working the opposite direction; left to right. Continue working from row to row, back and forth across the room, until you have finished the entire room. It may take 4, 5, or even 6 rows before you finish your room. 3. pull backward at an angle. only push and pull as far as you can lunge. 4. work you way from right to left across the room. 5. when you get to the end of the room, pull the vacuum backward to start on row 2. 6. work your way from left to right while on row 2. 7. continue working back and forth, pushing forward and pulling back at an angle, until you have worked your way out of your room. 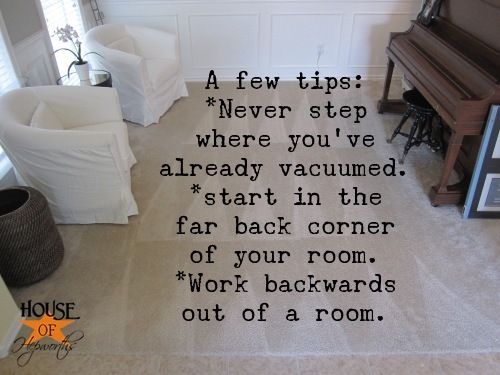 Never step on any carpet that has already been vacuumed. Otherwise you will have a nice footprint. To keep the carpet uniform looking, don’t take steps back and forth for each row. only push and pull as far as you can lunge. « I’ve got mini Chandeliers hanging from my lobes. Stella & Dot rocks. Thanks for the tutorial! You are too cute, thinking people were making fun of you!! I can’t imagine anyone doing that, but I suppose you never know. I love your blog, thanks for everything you post! I just want a stinkin’ Tyson vacuum. Come on, those rock!! OMG you actually posted about vacuum lines??!!?? Just kiddin’…I was totally serious and so glad you did this tutorial. I am so in awe of things like this but am thinkin’ my Bissel is not gonna achieve the greatness of your Dyson but I am literally going upstairs right now to test this out! Thanks and much love!!! You are always entertaining! My sister called me the other day asking how to make vacuum lines in her carpet. I told her, you just vacuum! I’ll have to pass this along to her. I personally don’t like vacuum lines. I purposefully mess them up after I’m done vacuuming! Vacuum lines? Wow….With 2 kids and 3 dogs, I barely have enough time to get my carpets vacuumed much less sit back and marvel at the lines I left. 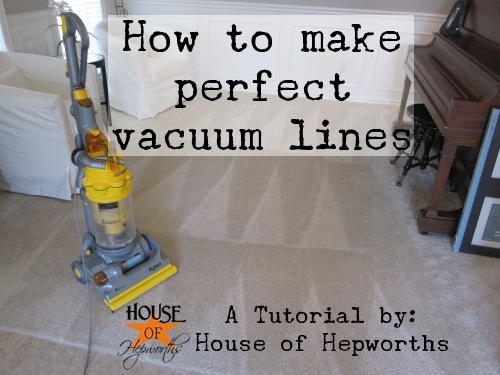 I’ll be sure to keep this post so I’ll know how to get those “perfect vacuum lines” after my kids have grown and my dogs are no longer with me Thanks for posting…..very helpful!!!!! Thanks for revealing your secret! Now I’m glad we have all hard flooring in our house 😉 I am just not that good about vacuuming in perfect lines! You are truly an expert! I have a carpeted upstairs and hardwood downstairs. I will forever prefer carpet over sweeping, mopping, sweeping again with the microfiber, mopping again, then crying because the dust settled. Ok… You may need to give my house a private lesson in what a vacuum is. No need for lines around here. This is my first thought when I read your post several days ago… “Wow, the thought of her coming to my house and sitting on my floor. She actually vacuums lines in the carpet.” Hey, wish my floor looked even half that good! When I was working for my dad cleaning the houses he had built- I had to vacuum and leave NO lines! That was a bit trickier, but to do it, follow the same basic steps, only instead of pulling the vacuum back at a sharp angle, use less of an angle so it runs right next to the area you just vacuumed. No lines! I still do this on occasion, just for fun. 🙂 Happy lines! Love it! Just wish I had carpet that was that nice!! My is just awful!! LOL ….. are there really people who DO this??? Can’t imagine me doing this…ever! But having said that, I remember my mother combing the fringe on a smaller carpet millions of times a day! And I also remember us kids, messing up the fringe all the time lol. You are hilarious! But I love the look of a freshly vacuumed room…even if it does only last for 5 minutes! I LOVE this! I am in love with my carpet having the lines and the fluffiness…seriously nothing makes me happier… and them more frustrated when the dogs run and roll all over my newly fluffed carpet! You are too cute! Love it! you are so funny! love the video! I also love the “OCD? You decide” comment, lol! Do you like your Dyson. I have an Oreck that I hate and don’t think was worth the money. I was just wondering if you really like your Dyson and feel as though you got a good vaccum for the money. 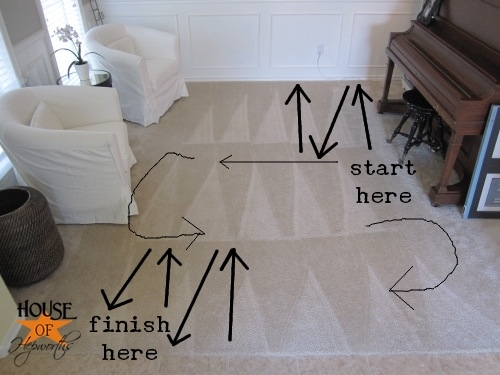 Thanks for sharing too how to make great carpet lines! For those who do not know how to properly clean their rugs or carpet, learning from this tutorial will be of great help. 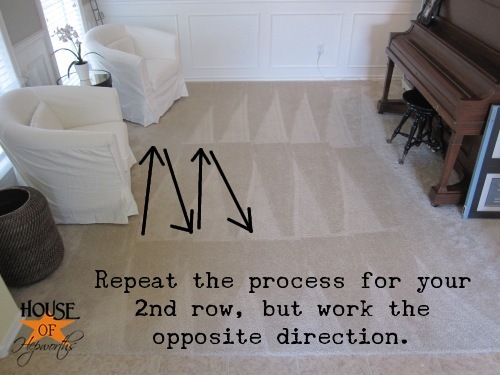 You will not damage your carpet flooring and you save time because you will be doing this task right. That’s a very much useful information you shared with us.. Thank you!! My maids vacuum doesnt leave lines at all, why oh why? i loves me some lines too!